Bring tradition and style to your home with our beautiful range of Georgian Windows. The Georgian period is an era characterised and remembered for classical architecture and design. With this in mind our Georgian Windows are designed to feature authentic Georgian bars. As well as offering a beautiful finish visually our Georgian Windows also offer improved insulation qualities that will help to keep your home lovely and warm whilst also saving energy. You can be assured of a high level of service and customer care from our team members; providing a fast, efficient and friendly service. Don‘t just take our word for it though, here is what one of our customers had to say about a window they had fitted at their property. Faroncrown Manchester is a Certass registered company, and all our windows are now installed with Pilkington K energy glass with argon gas as standard, helping you to save steadily against ever-rising fuel costs. And, for your added peace of mind, we offer a comprehensive, insurance-backed ten year guarantee on all products. 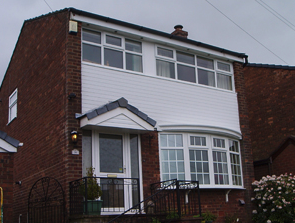 Offer a timeliness appeal to your property today with help from our Georgian Windows. Faroncrown Manchester have over 40 years experience within the industry and we are here to provide all the friendly help and advice you should need when it comes to choosing the perfect windows for your property. Add warmth, security, and value to your home at an affordable price. Contact our professional team today on 0161 366 7788.